Leading up to our trip to Boston, my husband was doing some research on Boston area eateries when he came back to me with a couple of different options of restaurants that he thought looked really good. One of which he suggested we try for brunch one day during our trip. 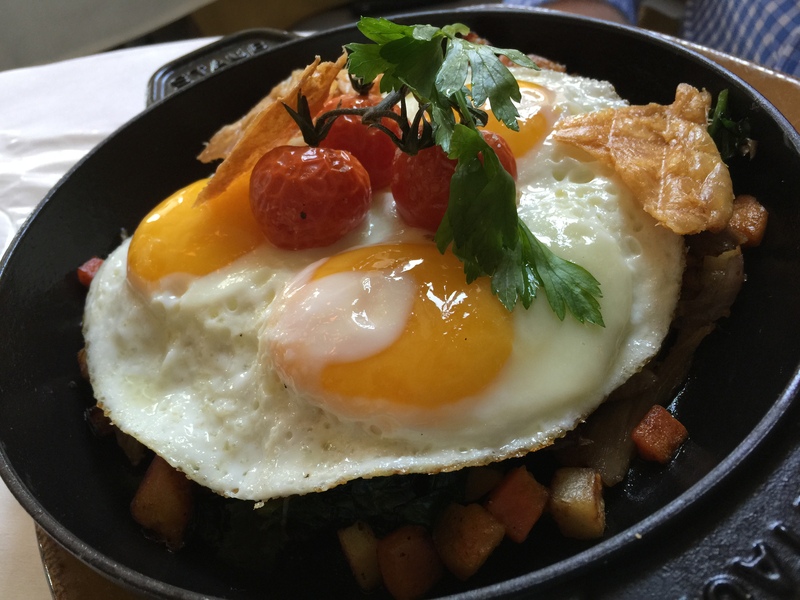 Brunch sounded like a good option to me since my husband and I rarely go out to brunch and it would be a great way to start our day before walking the Freedom Trail through much of downtown Boston. Mistral is a French-inspired restaurant located in Boston’s South End neighborhood. 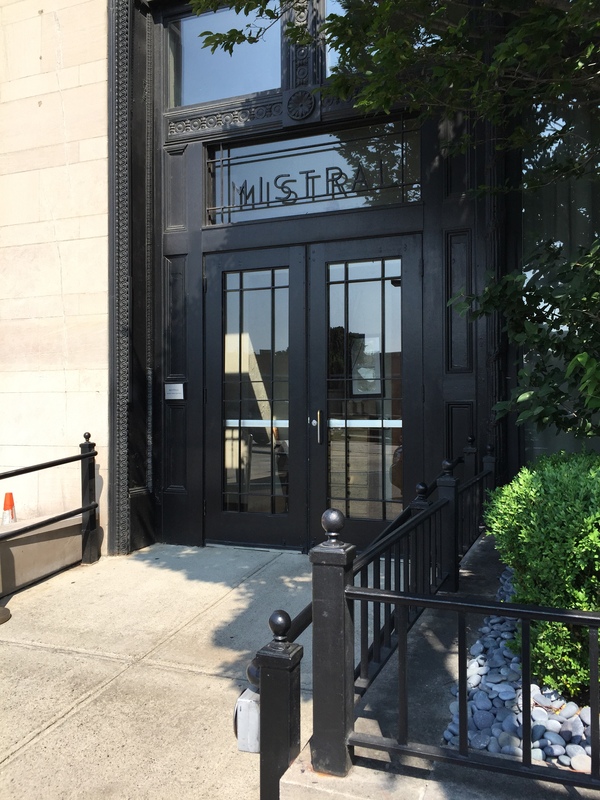 As part of the Columbus Hospitality Group, which has owned and operated some of the best restaurants in the city over the past decade, Mistral became the first restaurant in the group opened in 1997 under the guidance of Chef Jamie Mammano. With a full bar, the restaurant serves brunch, lunch and dinner featuring a French Mediterranean cuisine that highlights seasonal and local ingredients. The interior of the restaurant is light, bright and airy. According to the restaurant’s website, the interior design was inspired “by the wind that sweeps through the south of France” and is meant to invoke a feeling and aura that’s reminiscent of Provence. The restaurant’s decor features hand picked French pottery pieces, high ceilings and tall floor-to-ceiling windows which light up the restaurant’s interior from the outside. Starting off the meal, instead of a bread basket and butter, we were given a coffee crumble muffin with whipped butter and pineapple jam to accompany it. 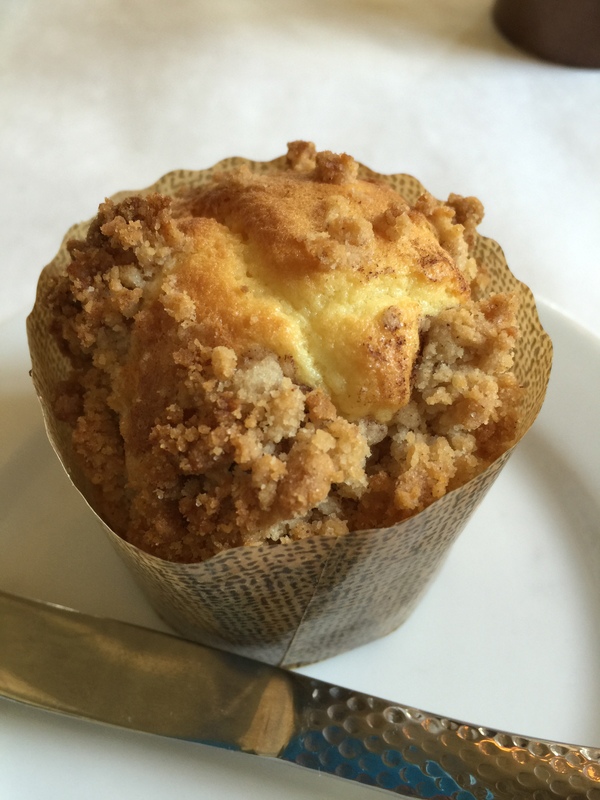 I liked the idea of a muffin for brunch rather than bread and it was quite tasty as well. Though, I must admit, the muffin was quite heavy and I only was able to eat about half of it, or else I wouldn’t have had any room for my brunch at all! I liked the touch with the pineapple jam as well, that was quite tasty too. 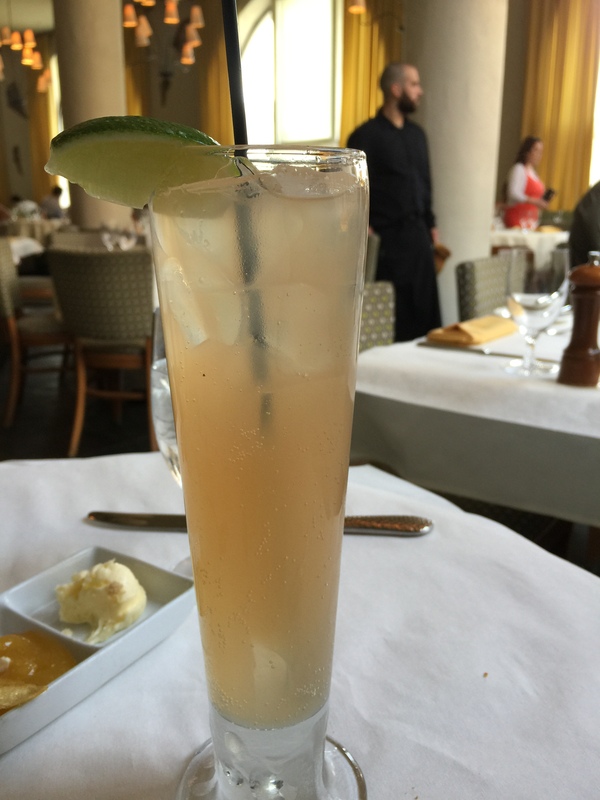 For drinks, my husband ordered a drink called the “islander” which was made with ginger beer, fresh lime and bitters. My husband is a huge fan of bitters, so when he saw bitters on the list of ingredients for this particular drink, it was decided then and there that he would order this. Of course, the mix with ginger beer and fresh lime also was terrific as it created a terrific refreshing flavor. My husband thought that the drink had a great, strong ginger flavor, which my husband enjoyed. He also said he could taste the bitters and that only added to the flavor the drink. It was a great early, morning drink to start the day. Valrhona hot chocolate with a hand crafted marshmallow on top was my drink of choice. Reading the description in the menu, and the fact that I love hot chocolate to begin with, how could I not order this drink? How amazing does this drink look? 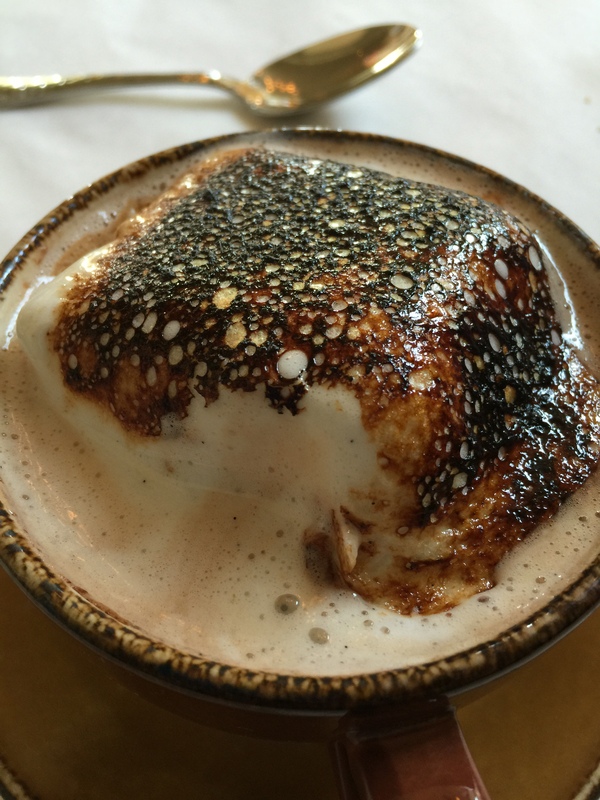 A nice, rich and foamy hot chocolate topped with this huge square of marshmallow that is the size of the cup itself and looked like it was torched right before being brought out to the table. Lucious and divine are 2 words that come to mind. The marshmallow was thick and creamy and admittedly, a bit hard to eat. While the toasted marshmallow looked really good, I didn’t actually love the taste of the toasted, burnt part of the marshmallow. However, once I allowed the marshmallow to melt into the hot chocolate, it was terrific. The creamy, sweetness of the melted marshmallow just added to the creaminess of the hot chocolate itself. Using valrhona chocolate made the hot chocolate decadent and rich. Talk about a wake up drink full of sweetness. We started off our brunch with an artisanal cheese assiette. Assiette is apparently just a fancy French term for plate, so a cheese plate, essentially. Served with house made jams and native honey, we were also given toasted baguettes. From left to right, the cheeses we received were a blue cheese made from cow’s milk, a soft cow’s milk cheese, a goat’s milk cheese and the last one was a cow and sheep’s milk cheese. The condiments on the plate included a red wine reduction sauce, apricot jam, native honey, homemade raisins and some pecans. We actually enjoyed all the cheeses and trying to figure out which cheese went best with which accompaniment. 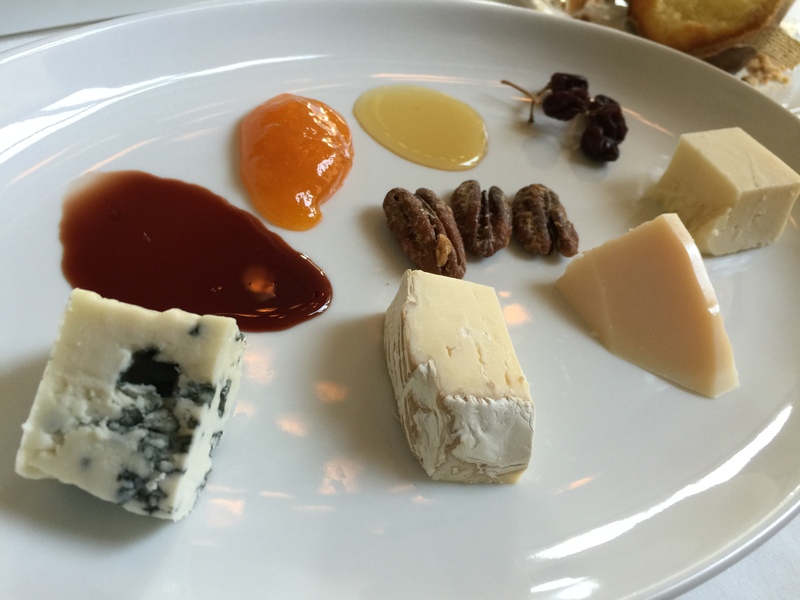 We finally decided that the blue cheese went best with the honey or the red wine reduction. 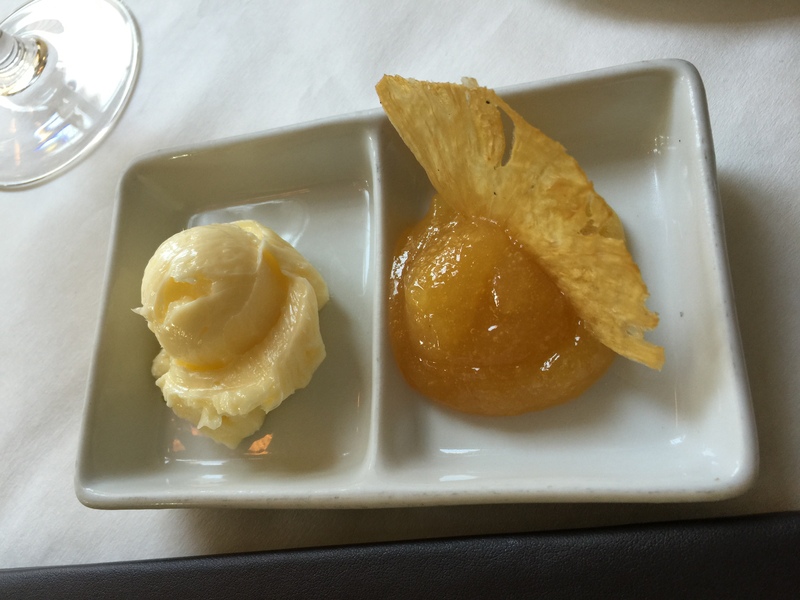 The cow and sheep’s milk cheese went really well with the apricot jam. Surprisingly, to me, the goat cheese was hard and tasted almost like a cheddar, which I really liked and was surprised by because I generally don’t like goat’s milk cheeses. That cheese went really well with the red wine reduction as well. 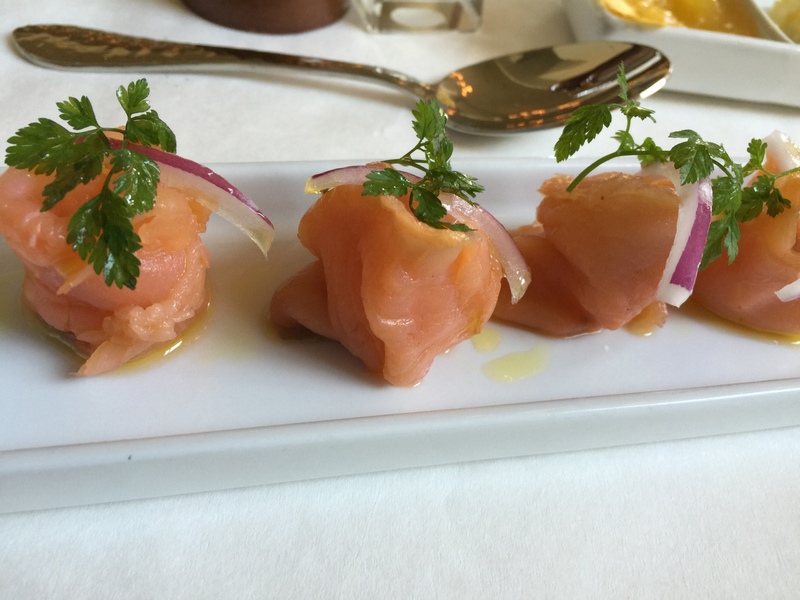 One of my husband’s favorite foods is smoked salmon, and he always gets excited when he sees it on a menu. From his love of smoked salmon, he’s really gotten me into it as well. So, he had to order a side of smoked salmon to go with this brunch meal. Simply served with some olive oil, a slice of red onion and a sprig of parsley, the smoked salmon was so good. The salmon itself was tender, and delicious and fresh. The olive oil just enhanced the terrific flavor of the salmon itself. This was more like a dish in and of itself rather than a side dish. My husband’s brunch was a confit of duck & root vegetable hash. I think all the dish needed to say was that it was made with duck and my husband would have been all over it, no matter what it was. Topped with farm fresh eggs sunny side up, the hash looked incredible, and I was a bit jealous that I didn’t order it myself. Along with the farm fresh eggs, there were also a couple of pieces of what looked like deep fried duck skin or something else equally as rich that my husband just loved. Whatever that fatty, crunchy item was, was actually my husband’s favorite part of the hash. The root vegetables and the confit of duck were perfectly cooked and the vegetables were tender on the inside, but a little charred on the outside, just the way you want to see in a hash. And of course, there was the tender, confit of duck which was rich and flavorful and worked so well with the rich starchy root vegetables. My husband thought the whole dish just had great flavors and all came together so well. 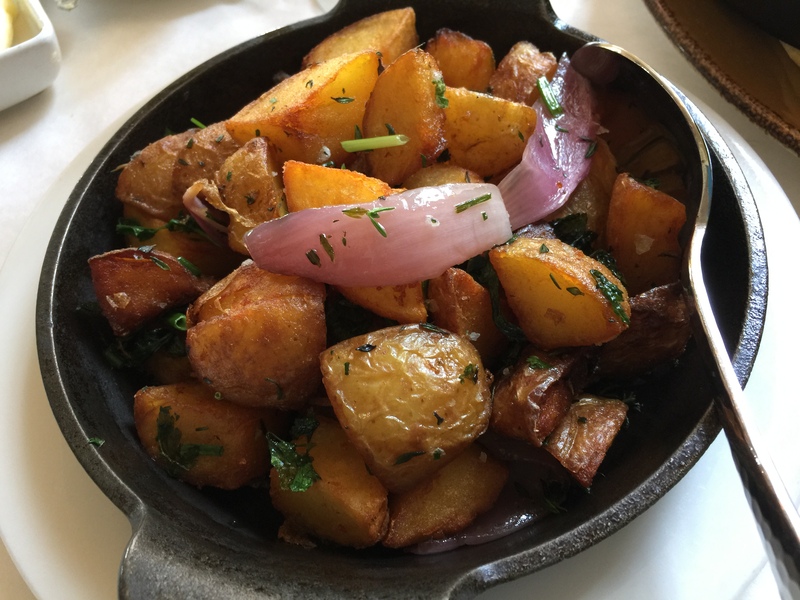 Being a meat and potatoes kind of girl, and since my brunch dish didn’t come with any sort of potatoes, I ordered a side of lyonnaise potatoes with my meal. Served in a skillet with potato quarters, herbs and red onions, the dish was delicious. The potatoes were perfectly cooked, warm and tender on the inside and crunchy and crispy the outside. The flavor combination with the light touch of herbs and the onions was perfect. I really loved these potatoes. It may have been my most favorite part of brunch. 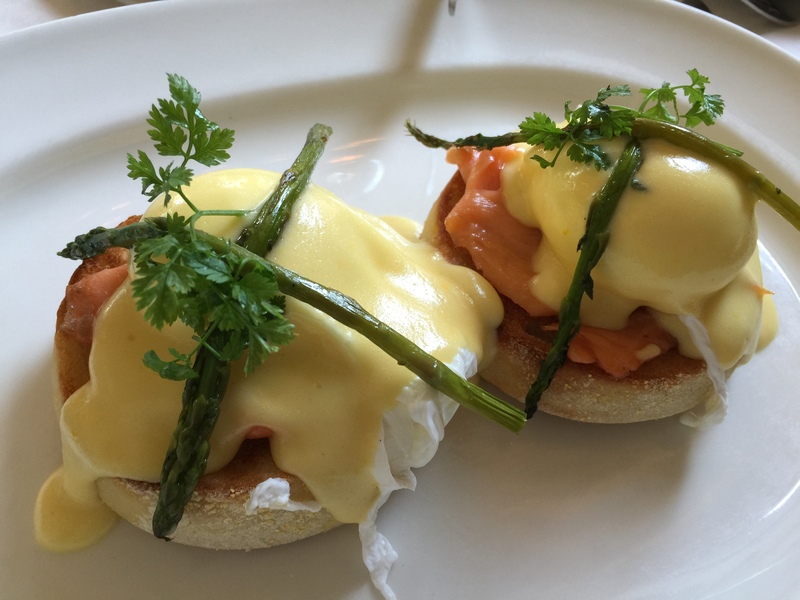 My selection for brunch was smoked salmon Benedict. I originally thought my husband was going to order this as he loves eggs Benedict, but when he saw the duck hash, he just couldn’t pass up ordering duck for brunch. So, I took the Benedict instead. 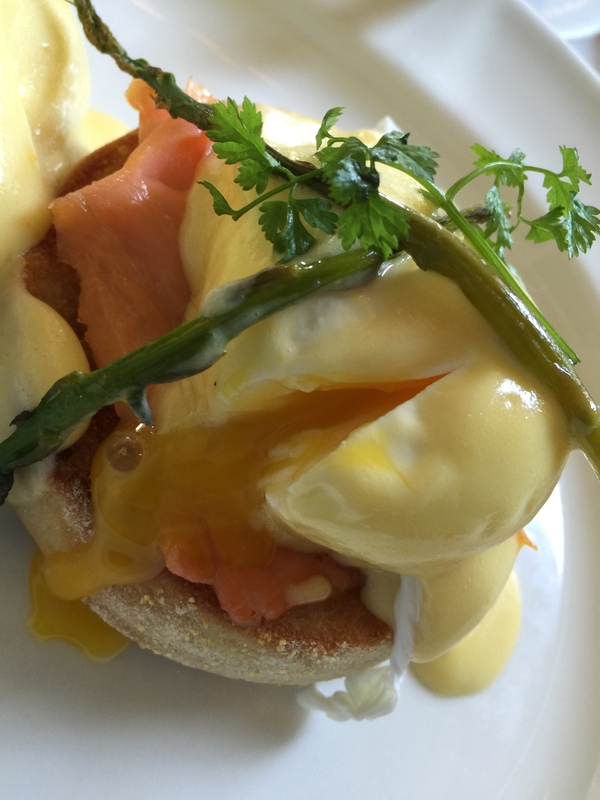 Served with roast asparagus and a citrus hollandaise, the Benedict was delicious. First off, the citrus hollandaise sauce was terrific with that tang of citrus that added that bit of oomph to the sauce. I liked the touch of the roasted asparagus and only wish that there was a little more asparagus to the dish. But the star of the dish was the smoked salmon, but I already knew it would be since we had that side of smoked salmon earlier. The flavor of the fresh smoked salmon with the citrus hollandaise was perfect. And the poached egg was just perfectly cooked, super runny as soon as I cut into it and the creaminess of the egg yolk with the fresh salmon was just delicious. Every part of the smoked salmon Benedict just complimented all of the other parts to make a great brunch. Mistral was a brunch stop for us. 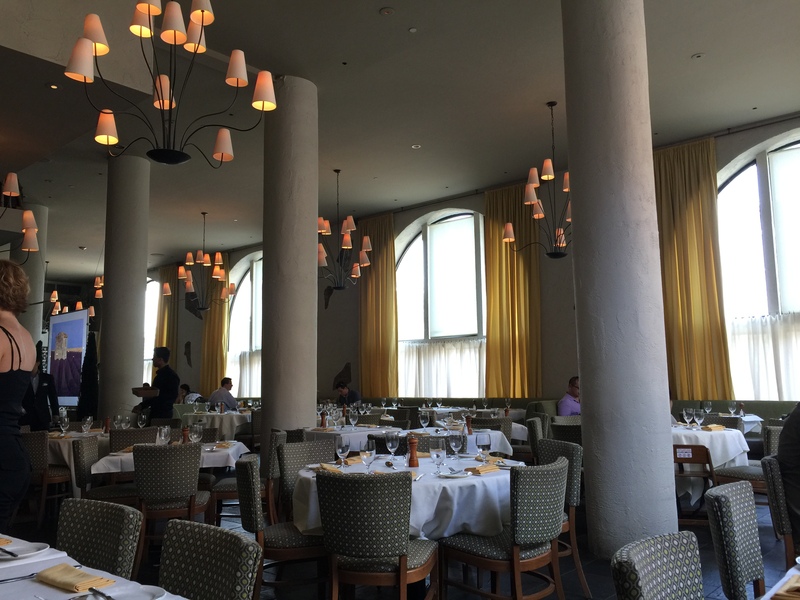 A beautiful restaurant with terrific, filling food to match the decor and ambience. The little touches such as giving us a muffin instead of a bread basket to start the meal, to having a homemade marshmallow to top a luxurious hot chocolate, to something as simple as an amazingly delicious and fresh smoked salmon side dish, Mistral doesn’t miss any of these touches. I have to give my husband credit for finding this terrific restaurant. It’s just too bad that we were only able to experience brunch here as I imagine that lunch and dinner are just as terrific.